* Wild Roses starts with a dirty, moist rose with a light hint of citrus. Sometimes, I get a little bit of dry grape when I wear it. * Especially for a natural scent, it starts off quite loud and brash – yes, wild. * After about thirty minutes, the single rose opens up and blooms into a garden of roses. It’s almost a bouquet with a fruity rose, a jammy rose, a spicy rose (almost like a carnation), and a dry rose. * The roses stay present into the dry down, when a dirty patchouli and a dry vanilla ground it close to the skin. Summary: Last October at the Elements Showcase in New York City , there was a Rose panel where we all smelled the different absolutes, oils, and concentrations of rose. Perfumers shared works in progress, and when I smelled Mandy’s Wild Rose, I commented that she had to finish this one off. 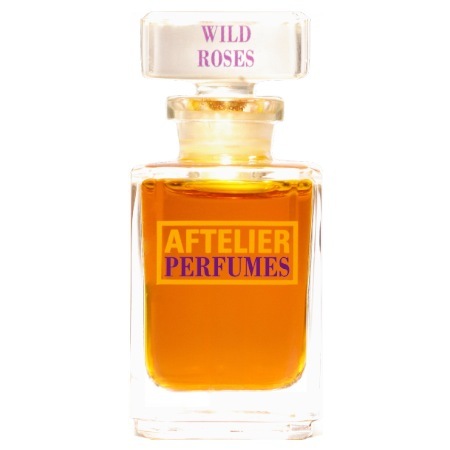 As 2012 was the year of the rose in perfumes, Wild Roses stands out as the best all natural rose that I smelled and probably the best new rose scent that I smelled all year. If you use 1-2 sprays, this could be office-safe though it will only last 5-6 hours on your skin (so bring an extra vial to freshen up after lunch or before you go out after work). To guys afraid of wearing rose scents, grow a pair and try this one. Aftelier Perfumes fragrances are available through their website. Disclaimer: Sample provided by Aftelier Perfumes for review. Image courtesy of Aftelier Perfumes Website. Thanks for this great review Ron! You were right that I should finish this one off, and I’m also glad you pointed out that guys can wear flowers too – I find quite a few who like it once they try it! This sounds really intriguing! I’m still looking for an amazing rose perfume, so perhaps I will give this one a try.